When I started my printing series, I had never heard of R. Mac Holbert, but Epson Professional Imaging Division’s Marketing Manager - Dan 'Dano' Steinhardt grabbed my attention when he declared Mac one of the top fine art master printers in the world. From there it was “game on”, and I knew I had to get to know Mac. When I had the pleasure of talking to Mac, I was stunned to find out that he started the worlds first digital print making studio in 1989 and that his first printer, an Iris 3047, is in the Smithsonian’s National Museum of American History! Mac currently owns an Epson 3800 and an Canon iPF6300. Until his recent retirement from Nash Editions, he was working with a Epson 11880, 9900, 4880, and two 3880’s. Epson Exhibition Fiber is his favorite glossy paper, but he’s also a huge fan of Epson Hot Press Bright (review coming soon) because of its increased DMax and color gamut. He generates paper profiles using the X-Rite i1iO Automated Scan Table as well as the X-Rite i1iSis XL Color Calibration System (B&H). While at Nash Editions, he had some weeks where he'd do as many as 2000 prints and others as little as 50 prints. Now he’s setting up a new non-profit printing center in Oregon with Henry Wilhelm & Stanley Smith where he’ll be printing to teach others the skills he has mastered over the years. So you think you know Photoshop? - Think again! Mac is the master! 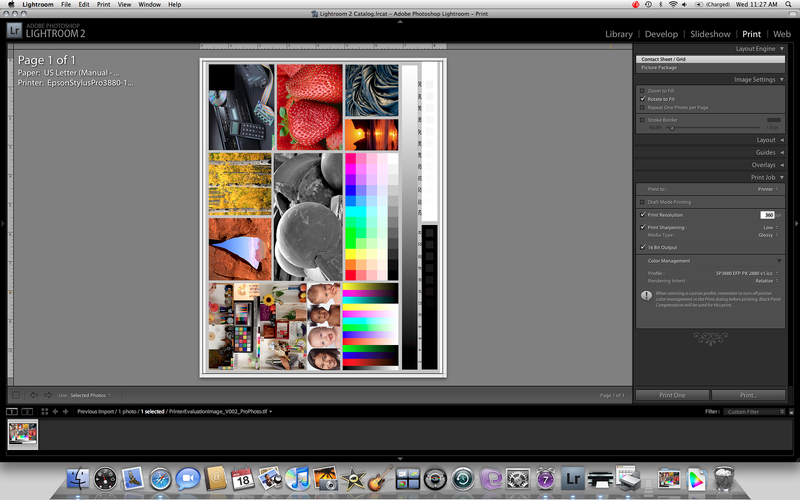 Mac is also the king of creating amazing non-destructive Photoshop layer stacks. If you check out page 70 of his Fine Art Digital Workflow Presentation, you’ll see the layers panel of the image on page 69 (and before image is on page 68). This is an amazing workflow that few possess the skill to pull off, and the beauty of it is that he can make a change on any layer and all the upstream changes will be applied. 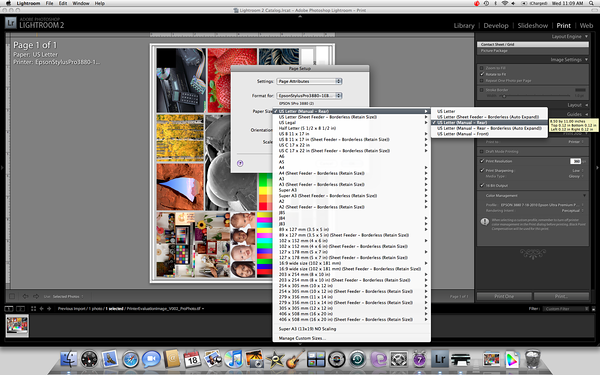 What Mac does with layers is pure Photoshop Utopia, so when Mac offered to re-image 5 of my files for print for me I jumped at the opportunity! It was awesome seeing how much could be done with adjustment layers, and I’m still using those files to retrain myself in a new digital workflow. Mac was kind enough to also share his Fine Art Digital Workflow Techniques where you can learn how a real master printer creates a fine art print from beginning to end! If you are going to be going longer than a week without using your printer, then turn it off. However, you’ll be using it more frequently than that, then he highly recommends just leaving them on all of the time. 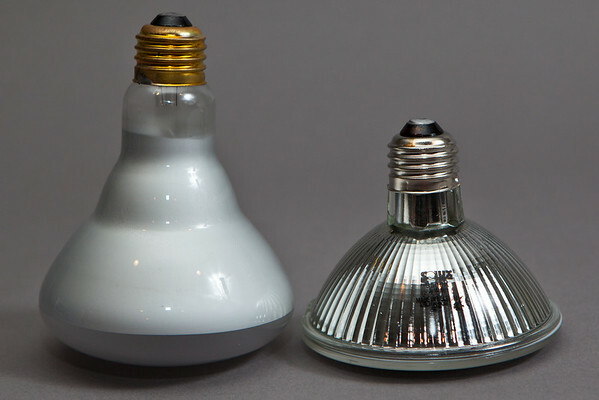 In his experience, things fail most often when you try turn them on, so just leave them on and you’ll be in good shape! If you are having problems with inks drying out or clogging, Mac has a great tip. He recommends going to a tobacco shop and buying a humidifier (a round aluminum canister with a sponge) and lightly moisten it (no dripping water because you don’t want it to spill) and leave it open near the print heads when they are not in use. 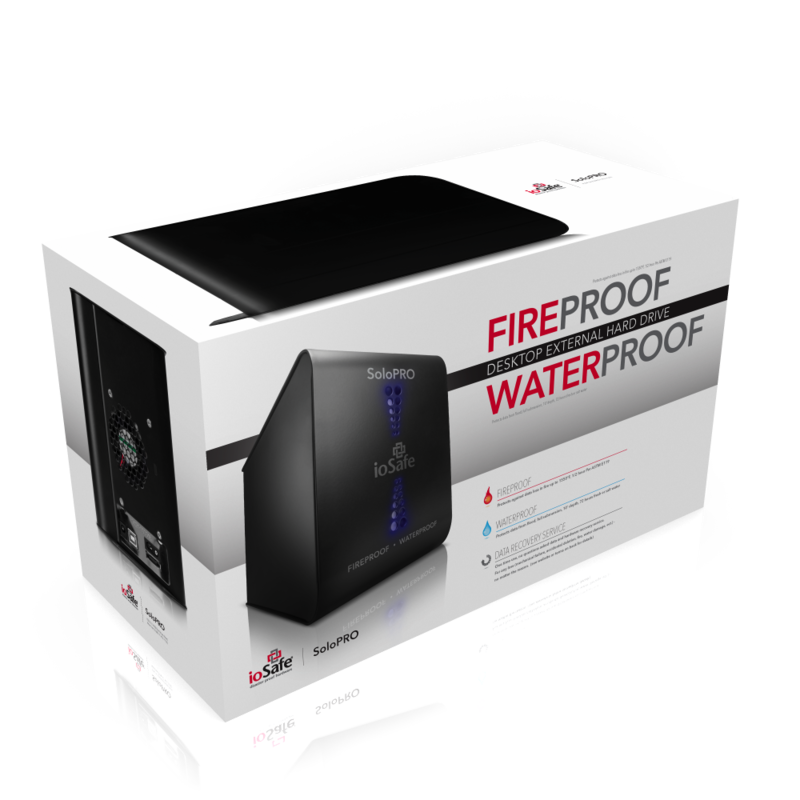 This keeps them moist to avoid cleaning cycles and clogging problems. Tips before printing and how to get the most out of the Epson driver? The decision of Relative Colormetric versus Perceptual is a personal choice to choice as there’s no rule of thumb. You have to look at it in your soft proof setup through the appropriate ICC profile and decide, but about 75-80% of the time he prefers Relative Colormetric. However, it’s best to make that decision when soft proofing using the correct paper profile. 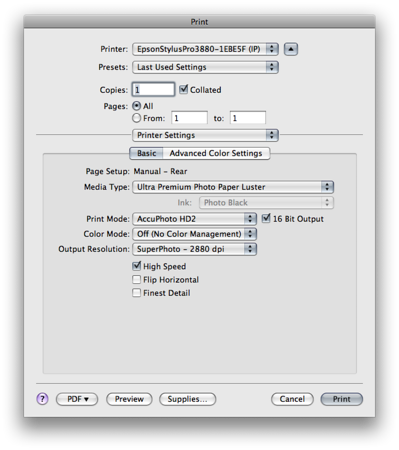 As mentioned in my Advanced B&W article, Mac prefers using Horizontal +3 and Vertical +3 when printing on Epson Ultra Premium Photo Paper Luster, or Horizontal +1 and Vertical +3 when using Epson Exhibition Fiber paper when you are looking for a neutral color toning. 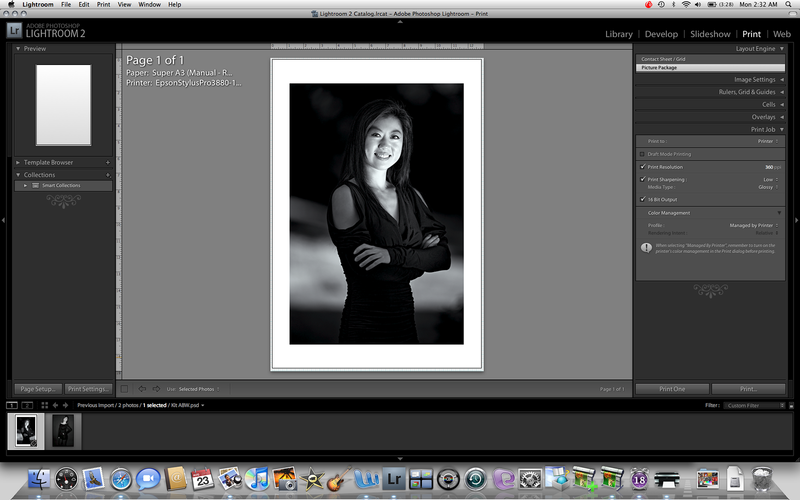 Make your Black & White conversion first and then send that through the printers Black & White mode (i.e., ABW). A money saving tip for those printing with Epson papers is to do all of your settings and one or two test prints using Epson Ultra Premium Photo Paper Luster and once you are satisfied that you have a great result then print on Epson Exhibition Fiber paper without making any changes. You’ll get a great result and you’ll save money by only using the best paper for the final prints. 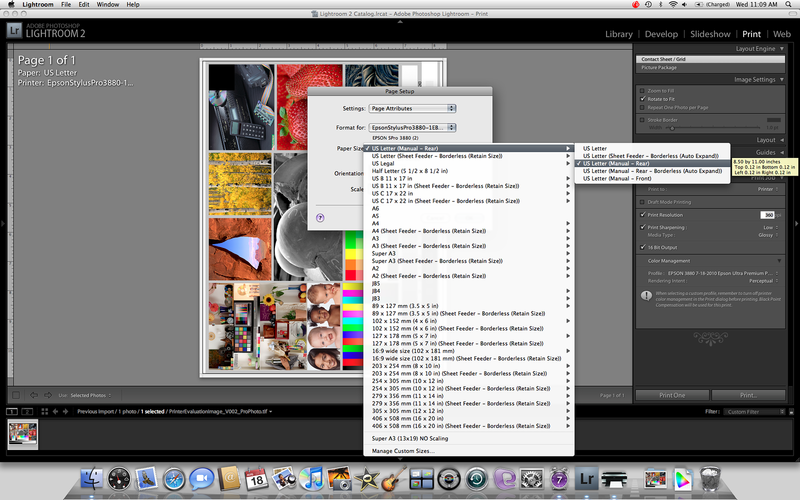 Like me, Mac is a big fan of Canon’s Export Module for printing from Photoshop. I’ll discuss this feature in my upcoming review of the Canon iPF6300, but if you’ve ever been frustrated by other printer drivers then you' are likely to love this one as much as we do! Mac has also seen some problems with Apple’s Snow Leopard, so beware and consult support and forums as necessary if you hit problems of your own. 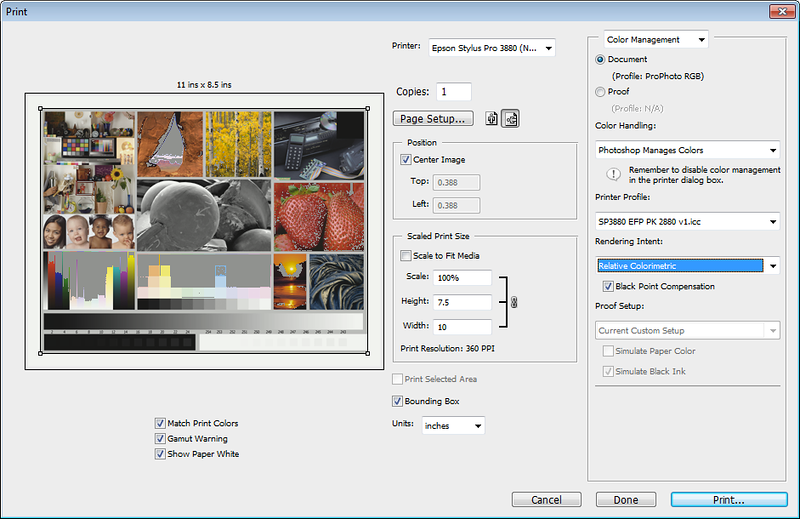 I’ve used Colorbyte ImagePrint (review coming soon) and Colorburst Epson Edition in the past. As I mentioned yesterday in my ABW article Silver Efex is a great way to prepare your images for black and white and even Mac highly recommends it! He’s also a big fan of my noise reduction roundup winner, Imagenomic Noiseware. Mac is also a member of PixelGenius, whose products are well known among veteran pro photographers (article coming later this year). It was a real pleasure to talk to Mac. He’s both a printing historian and legend. The things I learned from him about Photoshop will also help me to improve my imaging skills, so it’s no wonder he calls himself an Imagician! Check out his upcoming workshop schedule here and order his new DVD with John Paul Caponigro on this site. You can see some of Mac’s images on his web site here. I may get a commission if you purchase using the sponsored links in this article. Thanks for supporting the blog! This article demonstrates how I use the Advanced B&W Photo (ABW) printing feature with a Epson Stylus® Pro 3880 for both a PC and a Mac using Photoshop CS4 and Lightroom 2.7 (respectively). Before people ask, it should be noted that I am aware of Eric Chan’s Epson 3800: Step-By-Step Printing Workflow and I disagree with enough of it that I can’t recommend it. My recommendations are based on close consultation with Epson and many of the print masters interviewed on this blog, as well as my own subjective opinions. If my workflow changes, I’ll be sure to update this article so that it always reflects my current ABW printing workflow. While it is true that you could send your color image straight to the printer and let it do the conversion, it’s my personal opinion that this is like sending your photos to the drug store without ever looking at them on your computer. Sure you’ll get a result, but it isn’t likely to be one that reflects your artistic intent. For the image below, I love the color version but for this article I decided to do my own black and white conversion as it’s abundance of black and dark colors is a real test for any black and white output. Now there are many ways to get black and white output using Adobe Camera Raw (via Bridge, Photoshop, or Lightroom), in-camera presets, Photoshop’s grayscale conversion (never do this), Photoshop’s Adjustment Layer (Image->Adjustments->Black and White), and more, but none have really satisfied me. In fact, I went so far to say that I hated black and white images and that they should be a relic of the past. 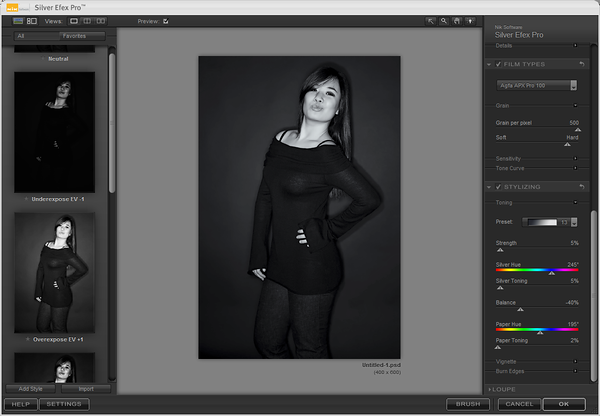 My disdain for black and white images vanished the day I discovered Nik Software’s Silver Efex Pro, and I’m not alone. During this series nearly every print master I spoke to has unanimously praised Silver Efex as being the best tool on the planet for getting great black and white images quickly and easily. Sure there are other ways to get identical results (which is true of every add-in product), but this product allows you to experiment and get great results very quickly that you will love – no matter what your taste is for black and white images. 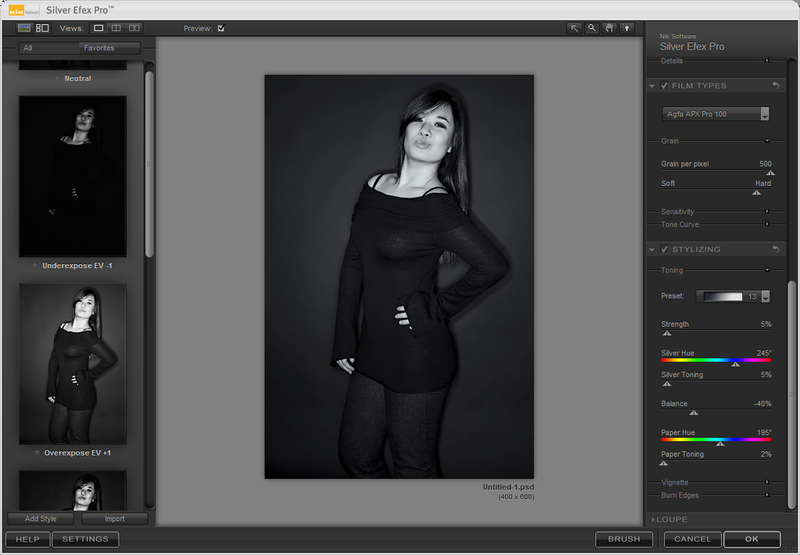 There are many things you can do in Silver Efex, but most of it is clicking around and experimenting. You’ll start with using a preset on the left column (if so desired) and in this case I just did a Overexpose EV +1 since the image was so dark. The next thing i did was use the Agfa APX Pro 100 film type and boosted the Grain per pixel to eliminate the noise found in that film. After that, I’m done – a click and voila – I’ve got a black and white image – in less than a minute with zero hassle and I love the results. There’s no other tool or product on the planet that can do that for me, so to say that I highly recommend this product when creating black and white images is an understatement. For me, it’s a must own! Click here to see my review of Silver Efex Pro and go to my discount coupon code page to get a great discount on it. 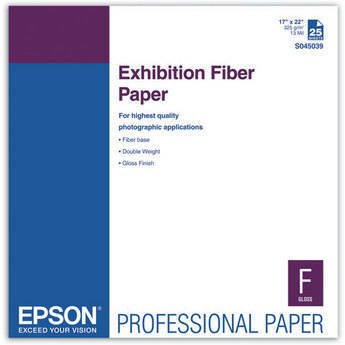 Epson Exhibition Fiber paper was designed to be like Silver Halide (AGX F) for the darkest blacks and the brightest whites. 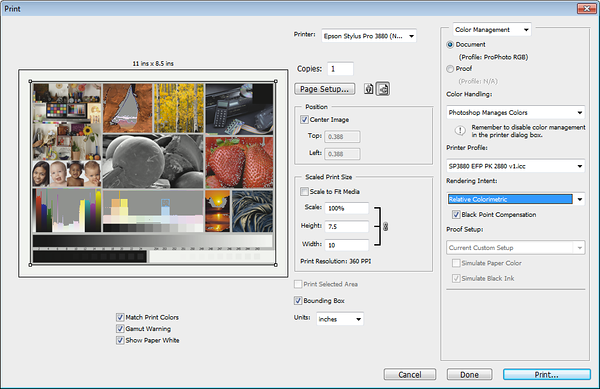 According to Epson, “with the introduction of EFP those using the darkroom finally had the tools to go digital.” It’s also suggested by Epson that it has the a DMAX that is better than any that could be done with AGX fiber papers (as high as 2.6 in ABW mode). While you can definitely use other papers, I’ve been blown away with the results using this paper so it is definitely my preferred paper for black and white prints. You may find that you’ll want to tweak these values for the best results given your paper choices as well. 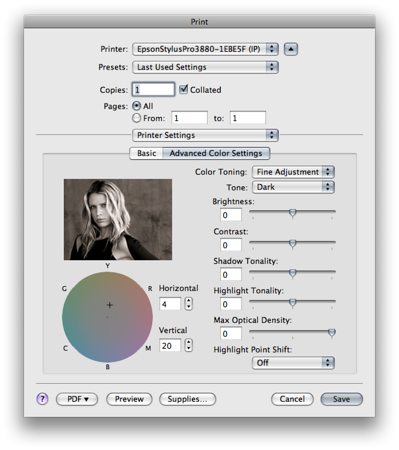 For example, printing legend R. Mac Holbert suggests using Horizontal +3 and Vertical +3 when printing on Epson Ultra Premium Photo Paper Luster, or Horizontal +1 and Vertical +3 when using Epson Exhibition Fiber paper when you are looking for a neutral color toning. I’ve had several print masters suggest (i.e., Greg Gorman, Vincent Versace, and many more) that Warm is their favorite preset. I agree that it is quite good, and I used it for the image above when printing, but it does effectively create a golden tone which isn’t always the best choice for every image. In fact, usually find myself preferring the Neutral tone to be the most pleasing (see test image 2 below), especially when using the previously mentioned R. Mac Holbert adjustments. Please keep in mind that these are subjective comments, and your selection could vary on per image basis. You should always experiment with your own images for the color toning choice that works best for your artistic intent. I will say that I found the Cool color toning option to be way too cool for my taste, and the sepia option was simply awful in my opinion. I personally can’t foresee a scenario where I’d enjoy using either of these modes, but you should do your own test and see which is right for images. Light Way too light in the background, but ironically for the jeans the tone is about right. Lips are too light. Normal Pretty good - the lips and background could stand to be just a dash darker, but certainly a usable setting for this image - like the jeans better than Dark. Dark Overall my favorite, so I agree with the recommendations. Lips starting to get a little dark and the jeans are pretty dark at the bottom - but still okay. Darker Facial shadows getting too dark, and jeans disappearing at the bottom into darkness. Darkest Skin tones are too dark and jeans are hard to make out at the bottom. Lips look gray and top of head is a black blob. Unlike these Color Toning options, these aren’t presets that map to values you can adjust in the Color Controls dialog, so you must pick one and accept the changes it makes. It is for this reason that I HIGHLY recommend you chose one value and always use that value, and then modify your source image to get the desired black level. 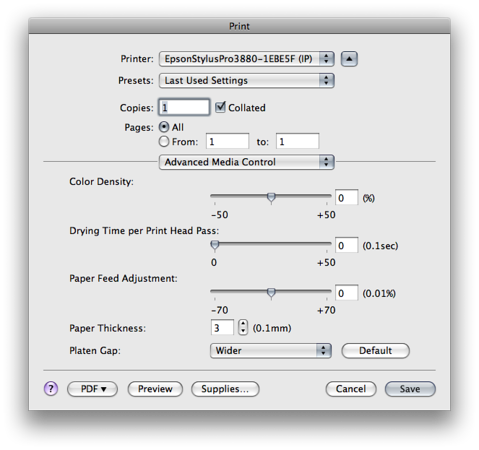 This will make your workflow much simpler should you need to do prints in the future and replicate your settings. What this exercise taught me on my own test image is that I may need to brighten up the jeans in post-processing to get the best overall result, but that Dark is the correct ABW printer driver setting. UPDATE: These values correspond to gamma changes (i.e., 1.8, 2.0, etc…) , which is why it is okay to use something besides Normal. 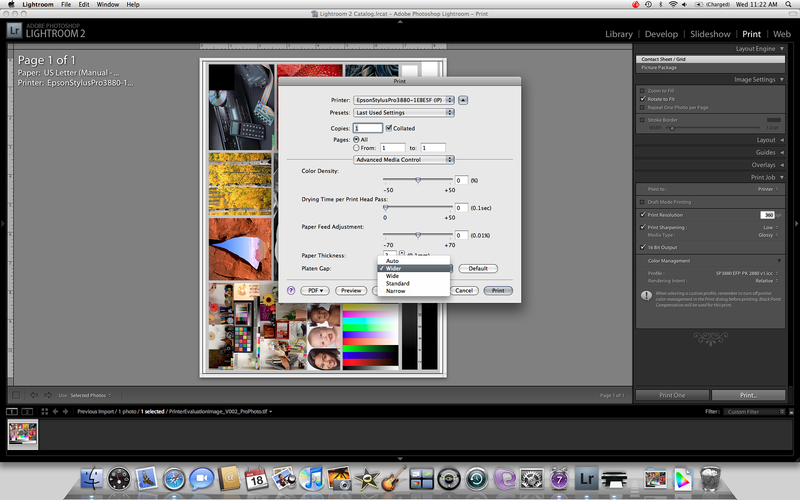 In Photoshop Print dialog shown above, we start by making sure we have the correct printer selected. Verify you have chosen the correct image orientation. It is CRITICAL that you set orientation (next to the Page Setup… button below) in BOTH the Print dialog AND the Epson driver – if you don’t, you’ll waste a sheet of paper. In this example we also are going to center the image and render it at 100%, so we clear the Scale to Fit Media checkbox. The Rendering Intent is supposed to be disabled, but it isn’t so choose Perceptual for Windows and Relative Colormetric for Snow Lepoard. I have reports from Epson and confirmed in my own testing that any other rendering intent can result in undesirable results. WARNING: Some combinations of operating systems, versions of Photoshop and Epson printers will have better results with Relative Colormetric than with Perceptual, so be sure to do an experiment with your configuration to see which works best. For Color choose Advanced B&W Photo. For print quality, choose your desired values but for me that was 2880x1440 and High Speed On. 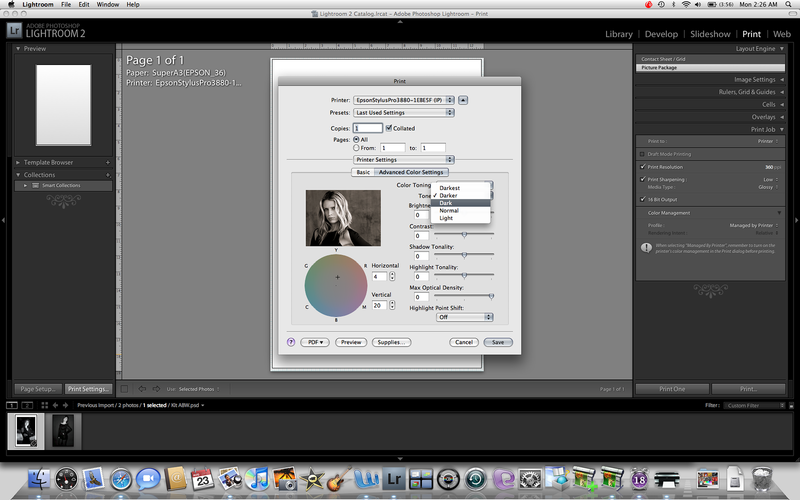 In this dialog start by changing the Color Toning to your desired value. I chose Cool for this image because I wanted a subtle blue tint. However, typically I chose neutral or warm. 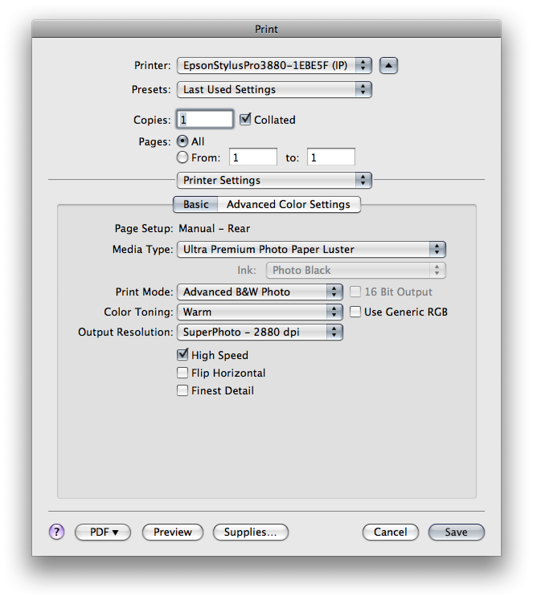 Once you have all of the settings above set properly, you can simply choose to print from the aforementioned Photoshop CS4 dialog. 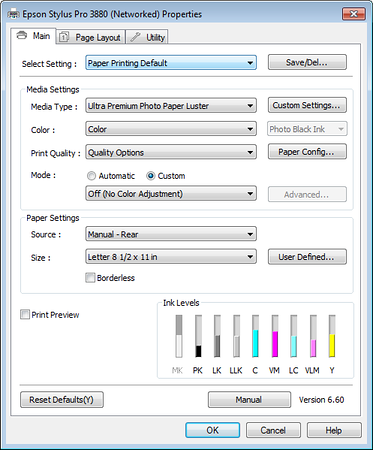 It will launch (on Windows) your Print dialog (see below) where you simply need to confirm your printer and choose Print. As in the example above, we want to start by telling Lightroom that instead of using a paper profile that we want the Color Management to be “Managed by Printer”. This is required for Epson’s Advanced Black & White mode. 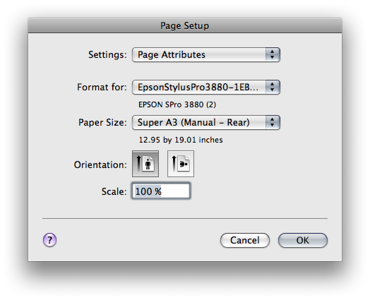 Next up is the most important page – printer settings. For this we need to make sure that we set the Media Type to “Ultra Premium Photo Paper Luster” because that is the correct choice when using Exhibition Fiber. 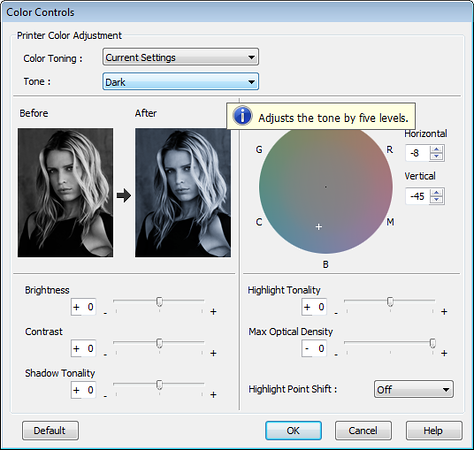 Unlike on the PC, on the Mac we set the Color Toning to Warm (or your desired value) directly in the Printing Settings section. We also set our Output Resolution to “SuperPhoto – 2880 dpi” and check “High Speed”, but leave the other values unchecked. 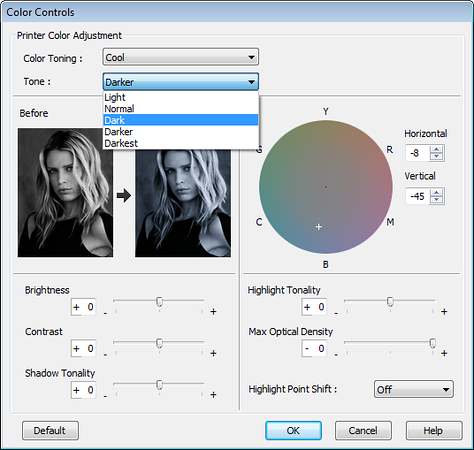 Next, you’ll go to the Advanced Color Settings tab of the Printer Settings page where the Color Toning has already been set based on the value selected on the “Basic” page. If you want to change the platen gap, then you need to go to the “Advanced Media Control” page and set it to Wider as shown below. Based on my results while making the prints for this article, I found this step was unnecessary as my best results were achieved with the default “Auto” platen gap setting. However, others have reported this is not the case (especially when doing borderless) so you’ll need to experiment and decide which is best for your printer. 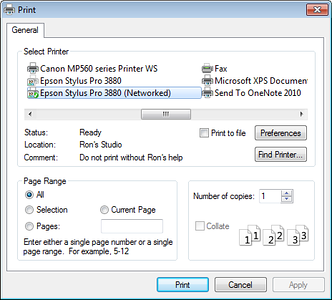 While not applicable to the 3880, some Epson printers may have a “Process Job by Printer” checkbox under Additional Settings. IF you see this, make sure you uncheck it! What about Printing in Color or using a RIP? It’s certainly possible to get great black and white results by printing in color, but the ABW feature of Epson printers has been fine tuned to get better results. I highly recommend using this mode unless you are doing split-toning (which won’t work in Epson ABW mode) or you have created a paper profile optimized for black and white mode (outside the scope of this article). I can say that my upcoming review of Colorbyte ImagePrint revealed some advantages over the Epson ABW mode thanks to its custom grayscale paper profiles. I don’t make the claim that Epson’s ABW mode is the only way to make great black and white prints – but I can say it’s very, very good! 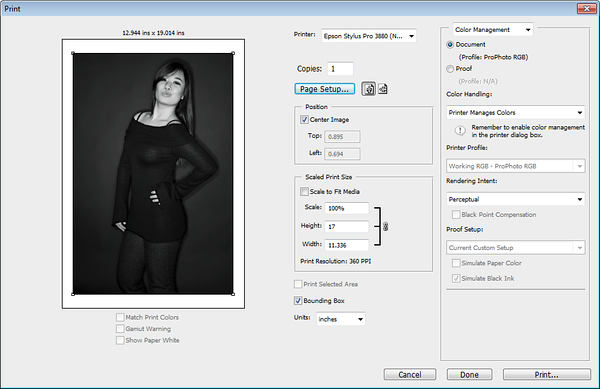 I am very happy with Epson’s Advanced B&W Photo (ABW) printing feature when used with a Epson Stylus® Pro 3880 on either the PC or Mac platforms using either Adobe Photoshop CS4 or Lightroom 2.7. The results are consistently better than those I have seen from printing in color, or using any third party service for black and white printing (except for MPix.com’s True B&W Paper). I highly recommend it and hope this article will help you enjoy great results too. It should be noted that I have used Lightroom 3 as discussed in this article and have been happy with the results, but for non-technical reasons I chose to do my exhaustive research with Lightroom 2.7. 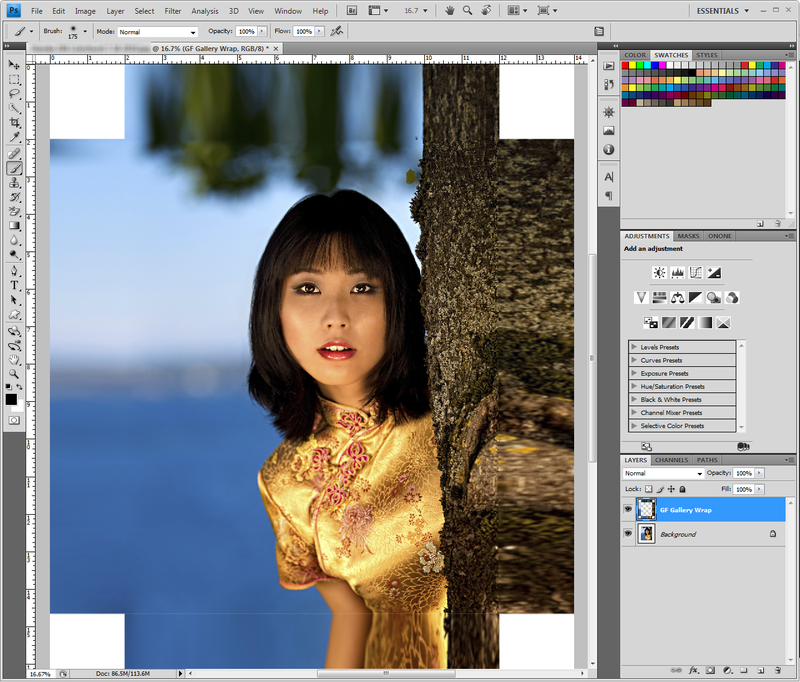 I have not done testing with Photoshop CS5 due to changes in the way CS5 prints, and because I simply don’t own that product yet. I may get a commission if you purchase using selected links in this article. Thanks for supporting this blog by using the links! In my older review on Genuine Fractals versus Alien Skin Software’s Blowup, I had found that on the test image for display purposes that Blowup 2 was the clear winner. However, during my longer term testing using my printers as another output target in the equation, I’ve found Genuine Fractals to be the superior product for a majority of the images I have resized (using Photoshop CS4, Lightroom 3, & Alien Skin Blowup 2). If your image just needs to be resized by a minor amount, all do very well (including the driver itself), but if you are needing to do greater than 25% resizes (especially upsizing), I find that Genuine Fractals gives me the best results of all the products I’ve used. Another great feature of GF6, is it’s gallery wrap feature (discussed at length in Randy Hufford’s DVD series, The Perfect Print). Using this cool feature you can create any of 4 different kind of wrap techniques (soft stretch shown below), and you can simply turn the layer off and get a plain white border which can be handy if you are doing both canvas and print images of the same shot. Another handy feature is the tile mode for scenarios where you have a smaller printer, but you want to do a tile/mosaic of a larger print. Using this feature you can make wall size prints using just a Epson Stylus® Pro 2880 printer. For a limited time, onOne Software is offering Genuine Fractals Professional Edition at a huge discount - $140 off!!!! If you print and you’ve been looking to get this product, now’s the time to get a great deal! Click the link above and make sure that RONM6 is the coupon code in your cart (as shown below) when you check out to save. I was provided a copy of Genuine Fractals to review and I may a commission if you purchase using links in this article. Thank you for supporting this blog by using my links when making your purchase! San Diego, CA – August 25, 2010 – Nik Software (www.niksoftware.com) today announced HDR Efex Pro, a completely new HDR imaging toolkit designed to help photographers quickly and easily achieve the full spectrum of HDR enhancements from the realistic to artistic. High dynamic range photography is a process in which multiple exposures are captured, aligned and merged to generate a single image that enables a much wider range of colors, highlights, and shadows. HDR techniques are typically used to enhance landscape, architectural, nighttime, and artistic photography. New HDR Efex Pro overcomes limitations in other software tools with a revolutionary all-in-one approach that enables both realistic and artistic effects to be applied within a single tool. Ideal for professional and amateur photographers, HDR Efex Pro provides an amazingly simple yet powerful workflow. 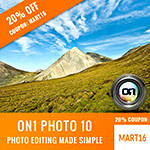 Photographers will enjoy single-click HDR imaging with categorized style presets, precise selective fine-tuning using Nik Software’s proprietary U Point® technology, advanced alignment and ghost reduction, full access to shadow and highlight details, and new best-in-class tone mapping algorithms. Color, contrast, and vignette controls enable photographers to further enhance their images to create amazing results. 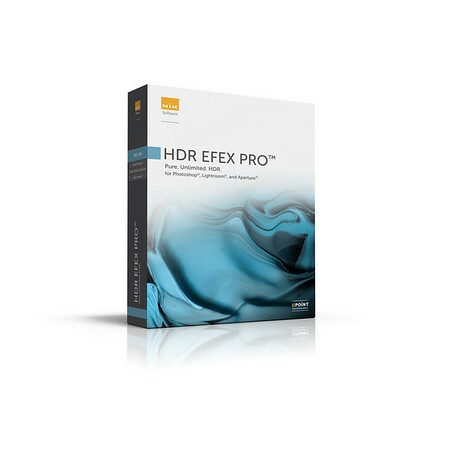 Users experienced with HDR will find that HDR Efex Pro offers a complete solution that takes the genre to new levels and offers new possibilities. 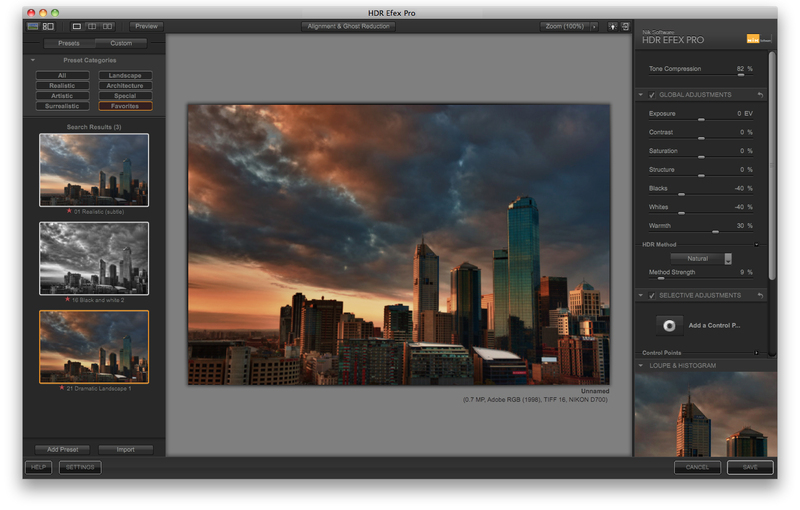 With HDR Efex Pro, photographers can also create the popular and dramatic HDR look from a single image. 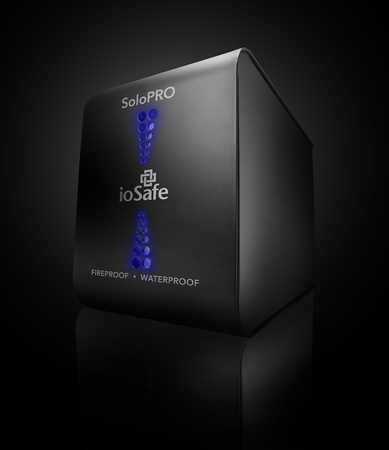 This feature enables photographers to reprocess images in which either an exposure series was not previously shot or for subject matter that does not lend itself to multiple exposures. 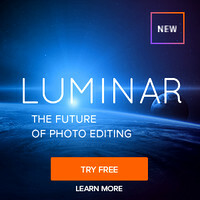 A streamlined workflow and tight integration with Adobe® Photoshop®, Photoshop Lightroom®, and Apple® Aperture™, enables the creation of spectacular HDR images quickly and easily within the software tools photographers already use. HDR Efex Pro has been designed with the power and control to empower those experienced with HDR photography as well as those just entering the realm of HDR. HDR Efex Pro will be available in the fourth quarter of 2010 for electronic and boxed delivery directly from Nik Software (www.niksoftware.com), through specialty camera retailers, and through online and national resellers. A complete list of Nik Software resellers may be found at http://www.niksoftware.com/resellers. The suggested retail price of HDR Efex Pro is $159.95. The software will be available as a free update to those that have purchased the Nik Software Complete Collection after July 25, 2010. HDR Efex Pro installs as a 32-bit or 64-bit plug-in for Adobe Photoshop CS3 through CS5, Lightroom 2.3 (or later) or Apple Aperture 2.1 (or later) and will be available for both Windows and Macintosh operating systems. 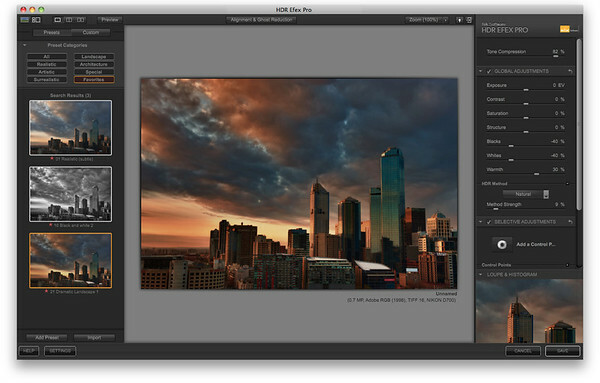 For more information about HDR Efex Pro, including a detailed product video and image gallery, please visit http://www.niksoftware.com/hdr. Nik Software, Inc. is a privately held company that develops software solutions and provides award-winning educational programs for the digital imaging and photography markets. Established in 1995, Nik Software has become the recognized leader in digital photographic filter development and produces award-winning technology and software products for digital photography and imaging professionals including U Point® technology (www.upoint.com), HDR Efex Pro™, Dfine®, Viveza®, Color Efex Pro™, Silver Efex Pro™, and Sharpener Pro™ software. For more information visit www.niksoftware.com. If you’ve been following my master printer interviews, you’ll notice a trend that many of these photographers list Epson Exhibition Fiber Paper (a.k.a., EFP) as their favorite paper (or at least favorite photo black ink paper). There’s a good reason for this — this paper has an amazing thick substantial feel yet a nice soft glossy finish that makes photographs pop. This is a bright paper with a killer dMax (a source at Epson claims a measurement as high as 2.6 in Advanced Black & White (ABW) mode) and a whiteness rating that’ll make you want to put your sunglasses on if you look at a blank sheet! Of all of the papers I’ve used thus far, this is definitely one of my favorites! This paper is also one of Epson’s favorite as it has the prestigious distinction of being one of the Epson Signature Worthy™ papers (video for EFP coming soon). These papers are for those who insist on the highest quality papers that perform extremely well with today’s best inks like Epson’s UltraChrome® K3 and HDR. When you buy this paper, you know you are getting what Epson believes to be the best media for their printers and something you should be proud to sign your name on. Based on my experiences with all of the Signature Worthy papers, I couldn’t agree more! Dan 'Dano' Steinhardt’s, an Epson Professional Imaging Division’s Marketing Manager now famous for “Dano’s Dictionary” was one of the drivers in the development of EFP and ultimately named EFP. In his own words, he says “the goal was to create a paper that was like a AgX F surface air dried print.” Based on what I’ve heard from everyone during this series, Epson succeed as the ABW performance is phenomenal! Click here to download a fact sheet, or visit the Epson Exhibition Fiber web page for more information. * = Data obtained from this report at Wilhelm Imaging Research and assumes the use of a Epson 3880 with Epson UltraChrome© K3 with Vivid Magenta inks. WIR implements the industry accepted methodology for determining lightfastness. You can get paper profiles for the Epson Stylus® Pro 3880 at this location or for the whole line up at this location (at least as of 8/20/10), but the direct link for the Mac and PC versions (no install program) for Epson Exhibition Fiber can be found here. I have found the above paper profile to be very good, so much so that I have not felt compelled to generate a new one myself. I feel that the Advanced Black & White performance is excellent and the color prints are hard to beat. ep3880Pk_EpsonExhibtionFIber 1440_RDAY – This is a color 1440 (Print Quality Level 4 – 1440x720) daylight balanced reciped* profile. This yields the results closest to the Epson profile. ep3880Pk_EpsonExhibtionFIber 1440_RF2 - This is a color 1440 (Print Quality Level 4 – 1440x720) cool white fluorescent lighting optimized reciped* profile for portraiture work. 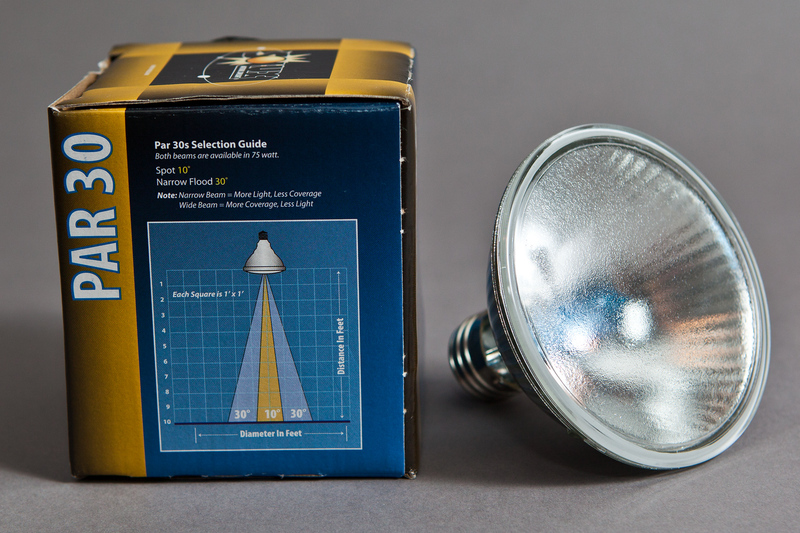 This is a good general purpose profile for mixed lighting conditions. This is my preferred profile for this photo. ep3880Pk_EpsonExhibtionFIber 1440_RF3 - This is a color 1440 (Print Quality Level 4 – 1440x720) mixed lighting optimized reciped* profile for scenarios where your image will be under mixed light. 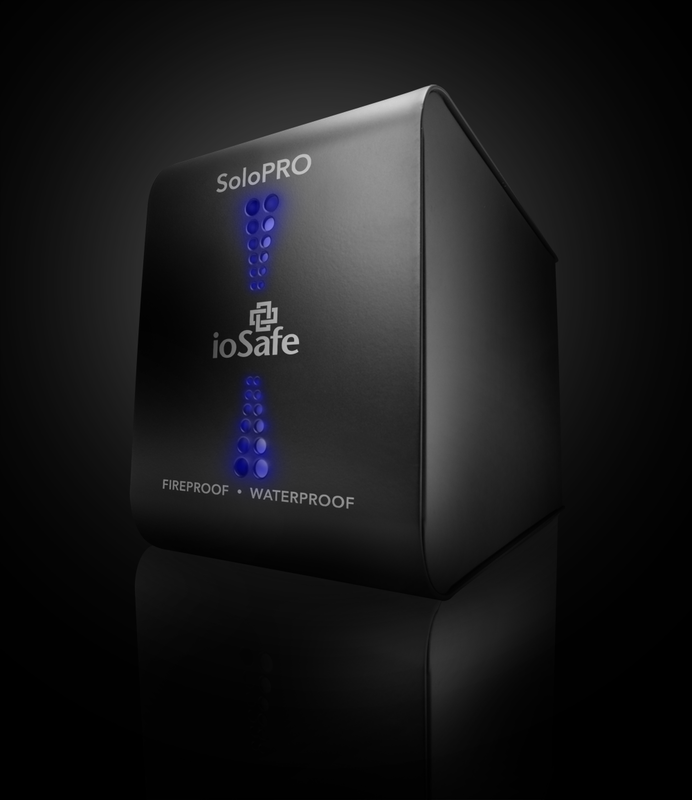 This is a good choice if you don’t know what to use and you are unhappy with the RDAY or Epson driver results. ep3880Pk_gray_EpsonExhibitionFiber 1440R – This is a black & white 1440 (Print Quality Level 4 – 1440x720) all-lighting optimized reciped* profile. This is my preferred profile for this photo. 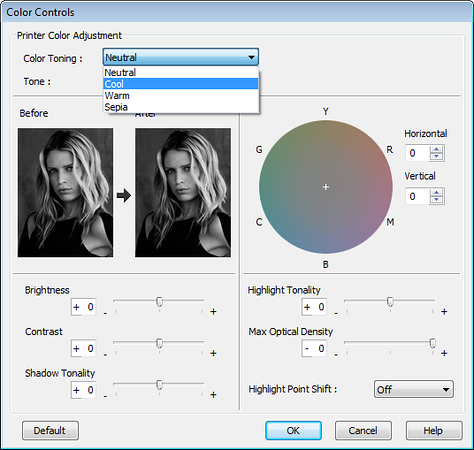 * = A recipied profile is a special profile made by ColorByte that contains additional information used to control the inks in a special way for particular paper/ink combinations. Since this is an expensive paper (but competitively priced for its class), it is painful to do any significant test printing with it or have a print go horribly wrong with it. It has been suggested by R. Mac Holbert and others that you can use Epson Ultra Premium Photo Paper Luster for your test prints, and I agree. In fact, I’ve even had success printing to Epson Ultra Premium Photo Paper Luster using my “SP3880 EFP PK 2880 v1.icc" paper profile. This allowed me to fine tune my print with cheaper paper, so that when I was ready to print the final image all I had to do was put the correct paper in the printer and I was good to go. Vincent Versace warns that you should set the platen gap to Wider when using this paper, but I didn’t find that to be required on my 3880. However, I would recommend that practice just to be on the safe side. Media Type: Ultra Premium Photo Paper Luster - There is no media type for this paper, so I use the recommended “Ultra Premium Photo Paper Luster” which is thinner so that’s why you may need to widen the platen gap to Wider (via the Paper Config… button). 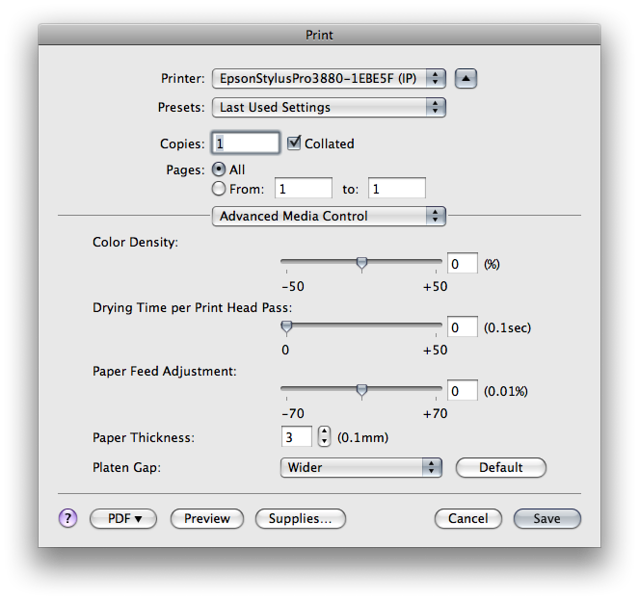 Print Quality: LEVEL 5 (Quality) – The paper profile is optimized for this resolution. In a future article I will show how the only penalty is speed (2x slower) as the ink usage and cost between 2880 and 1440 is insignificant. 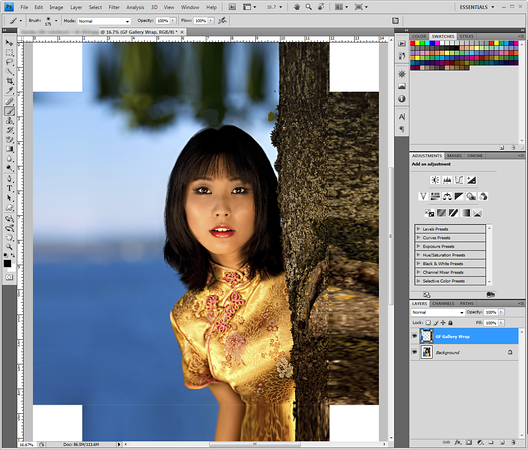 Mode/Color Correction: Off (No Color Adjustment) – I let Photoshop manage the color using the paper profile provided by Epson mentioned earlier rather than using the driver itself Both yield good results, but I prefer the Epson profile. You can ignore the rest of the settings on the dialogs shown above as they were specific to my print job. You should adjust each to match the needs of your print job. When clicking on the Paper Config… button you are presented with the default media type values as shown above. You could change Platen Gap from Auto to Wider, but I didn’t find it necessary. Your experience may differ so if you get head strikes or banding, try this option first. In Photoshop I used the Epson profile mentioned earlier and printed the test image using both rendering intents. After carefully evaluating the two prints under a GTI PDV-2020Ex, my personal preference was the Relative Colormetric as the blue tones in the sky gradient was slightly better. There were no drastic differences, so either is fine. Both went to 8 for the black blocks on the bottom and 251 for the white, but Perceptual did seem to show a faint sign of the 252 block. This is a subjective test though so you may want to do your own personal testing while softpoofing to see which rendering intent matches your preference. 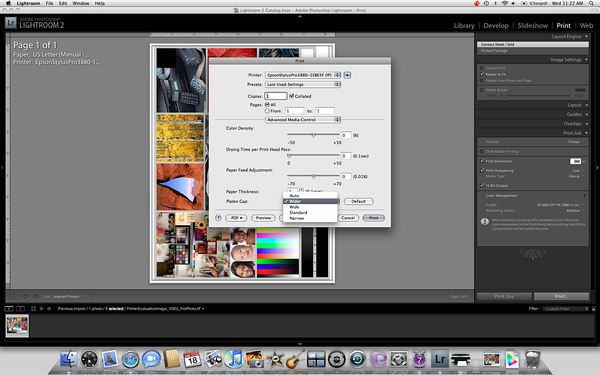 In this example, I use the Outback Print Printer Evaluation Image to print from Adobe Photoshop Lightroom 2.7 (ACR 5.7) Print Module on a Apple Mac OS X 10.5.8 MacBook Pro. 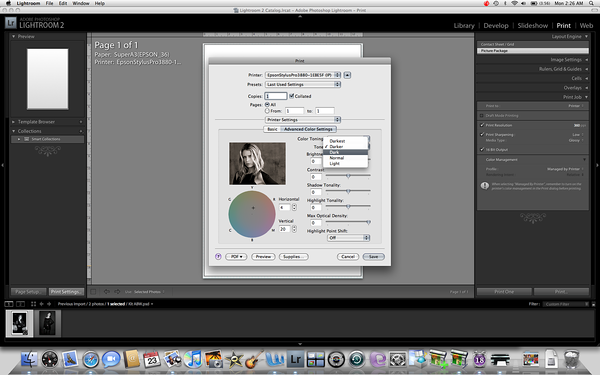 The same identical concepts in Lightroom apply to a Windows based system but the Epson driver will look like the one shown above in the Windows example. Print Resolution: 360 - I also chose 360 for the print resolution, but the default of 240 is a works well for Epson printers too. Print Sharpening: High (usually) - You usually want sharpening turned on unless you’ve already optimized your image for print using a product like Nik Software’s Sharpener Pro. 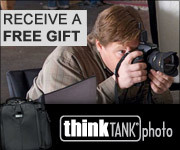 Scott Kelby recommends using High, and generally speaking I agree. For this test pattern I meant to set it to Off, but forgot so for the whole series I will always use these settings – even on Matte media types just for print to print consistency. Media Type: Glossy - This is a glossy paper so I chose the Glossy media type. 16-bit Output (Mac Only): On – While there’s no hard data to prove that 16-bit really makes a measurable difference, it can’t hurt so why not turn it on? 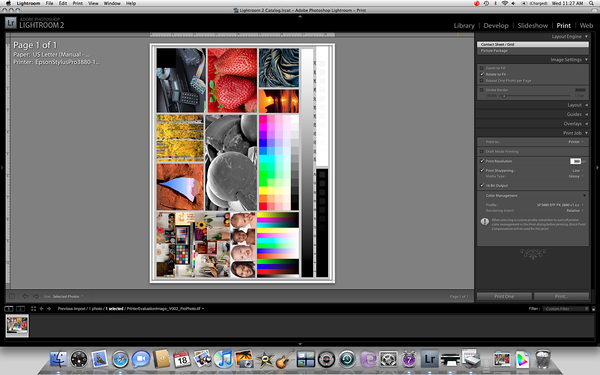 At the bottom left pane of Lightroom (not shown) there is a Page Setup… button. You must click this button to select the correct paper size and tray on the Mac. it is very confusing and a stupid design, but this is how it works. In Paper size click on the list and choose your paper size (NOTE: Super A3 = 13x19”) and be sure to make the correct selection depending on your desire to do borderless or not. From there you must choose from another fly out menu (ugh) and be sure to select both the paper size AND the tray. For this example I’m printing on US Letter and I want to use the rear manual tray, so it’s pretty obvious which one to choose in the first menu but my real selection is hidden in the middle of the next fly out menu as shown above. This is a Mac only thing as paper sizes are found in the Epson driver on the PC under Paper Settings Size list – but it’s fairly confusing too (at least borderless is just a checkbox though). 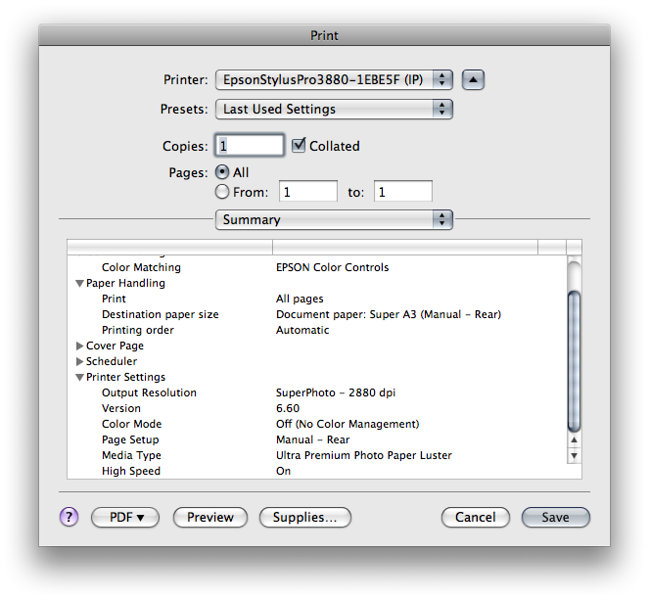 Generally speaking, the only page setup changes you should ever have to make are selecting the right printer (in Format for above) an the paper size. You can change orientation too, but I didn’t bother. 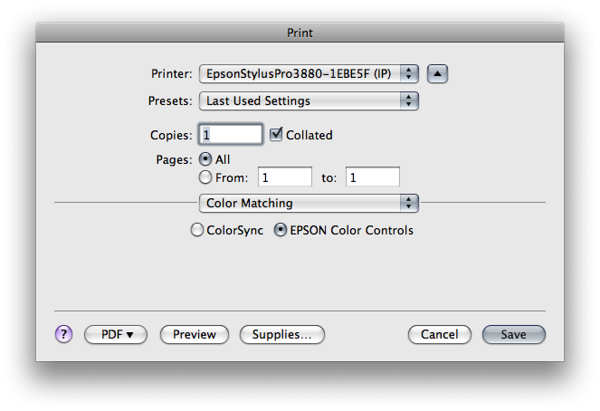 Now if you choose the Print Settings… from the bottom of the left pane (to the right of Page Setup…) or the Print…. 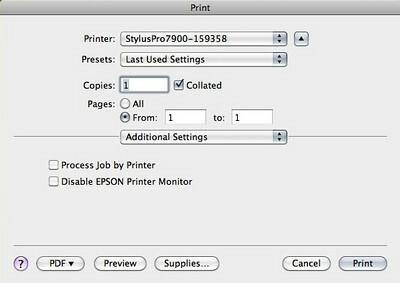 button at the bottom of the right hand pane, you should get the Print dialog shown below (but perhaps a different page will be selected in it).The only difference between the buttons is that the one on the left will just change your print settings and not print and the one on the right will send the job to the printer when you click okay. 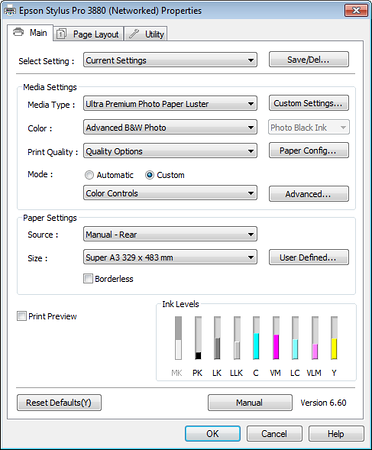 The most important page in the Print dialog is the Printer Settings page as shown above. I’ll focus mainly on the basic section at the bottom of this dialog because the contents Advanced Color Settings should be grayed out when you switch to it if you did everything properly. Page setup should also say Manual – Rear for this paper and can only be changed via the previously mentioned Page Setup… button. Media Type: Ultra Premium Photo Paper Luster - As mentioned in the Photoshop section, there is no media type for this paper. 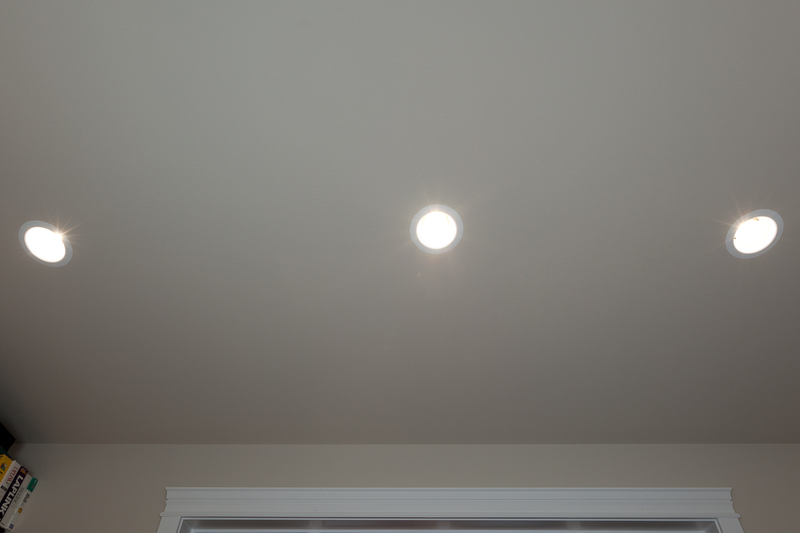 I use the recommended “Ultra Premium Photo Paper Luster” which is thinner so that’s why you may need to widen the platen gap to Wider (shown later below). Output Resolution: LEVEL 5 (Quality) – The paper profile is optimized for this resolution. In a future article I will show how the only penalty is speed (2x slower) as the ink usage and cost between 2880 and 1440 is insignificant. I do have examples where the quality improvement has been verified by multiple sources in blind tests, so it is my preference to always choose 2880x1440 (L5) output resolution. Mode/Color Correction: Off (No Color Adjustment) – I let Lightroom manage the color using the paper profile provided by Epson mentioned earlier rather than using the driver itself. Both yield good results, but I prefer the Epson profile. 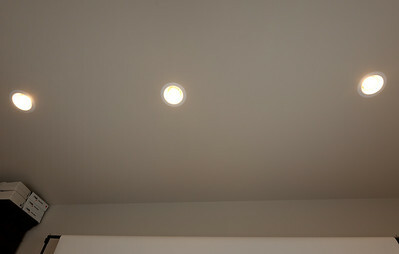 High Speed: On – works well with high speed (bi-directional) so I’ve found no measurable advantages to turning this off. 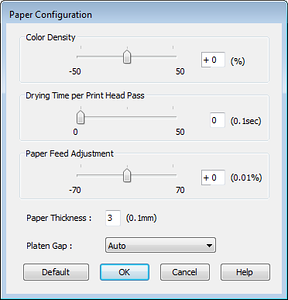 If you want to take Vincent Versace's advice and change the Platen Gap to Wider, then choose the Advanced Media Control page in the Print dialog and go to the Platen Gap list at the bottom as shown above. Change Auto to Wider as shown above and below. You can now choose print and you should hopefully get an amazing print on Epson Exhibition Fiber paper, if you did everything properly. Of all the glossy papers I have tried for the 3880, the only one that I’ve tried that I like as much is the Epson Ultra Premium Photo Paper Luster (review coming soon). The Luster is a good paper, but it is a lot more flimsy than EFP. However, the Luster is much cheaper and comes in larger quantities, so I highly recommend that you use the Luster to create your test prints before loading the printer with Exhibition Fiber. I’m still new to papers and printing, so I’ll admit that my expertise is rather limited still so I may revise my thoughts here as I become more educated on other papers. Of all the Epson papers, I still find it hard to beat the Epson Hot Press Bright (review coming soon) for its amazing color, detail, and wonderful substantial feel. However, this is very, very close and matte black ink is no substitute photo black in on certain subjects so which one you choose really depends on the subject. As of August 21st, 2010 B&H had the sheet papers starting at $39 and going all the way up to $149 and the rolls from $159 to $599. JVH Tech has it listed as $2.29 per sqft. This makes it a more expensive paper, but on par with papers in the fine art classification. Exhibition Fiber Paper is available in 8.5”x11” (Adorama), 13”x19” (Adorama), 17”x22” (Adorama) and 24”x30” (Adorama) is 25 sheet packs. I really wish Epson would add legal size and 24”x25.5” to better accommodate the wider aspect ratio of modern day cameras, but based on the feedback I got from such recommendations I’m not going to hold my breath. It appears they believe strongly that no one really wants those sizes. EFP has also just been released in 50’ rolls in widths of 17, 24, 44 & 64 inches. 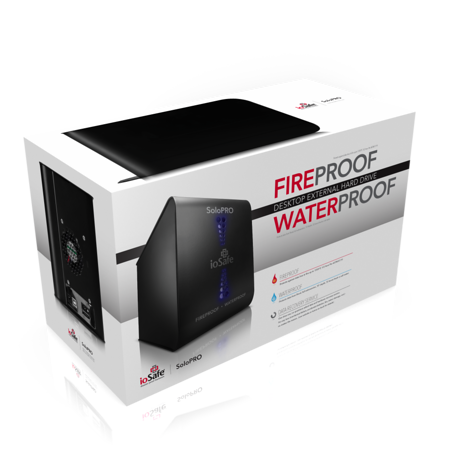 My recommendation is that you purchase it from Adorama or B&H using the links above or from Amazon using this link. If you are in Washington state, you can get instant gratification and a good deal from JVH Tech, which is where I’ve got most of my Epson paper from. 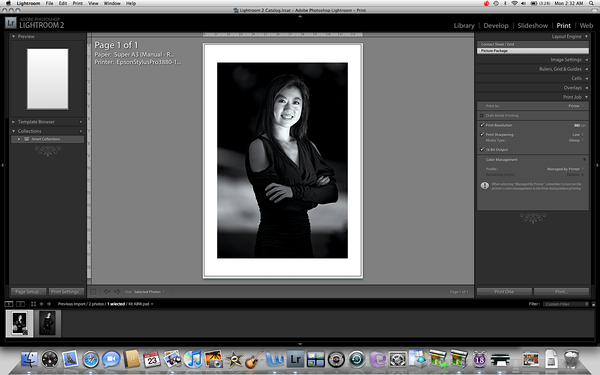 I will also be doing a separate article on Epson’s Advanced Black & White Mode where EFP is the natural choice. Be sure to check it out when it is released! Epson has provided me with a 25-sheet box of 8.5”x11,” 13”x19,” and 17”x22” (of which nearly all were used up in testing :( ) as well as the Epson Stylus® Pro 3880 I used to print them with. If you use the links provided in this article to make a purchase, I may get a commission. Thanks for supporting this blog by coming back to use the links when you make a purchase.